The month of December was filled with finding our way around our new town, trying new recipes, going to the beach, and attending Christmas parties. We also got to experience the magic of Stand Down Period, where Curtis’ work hours were reduced and we had more time to settle in! As mentioned before, we started our new garden, and it has so far produced 2 strawberries which we ate immediately. Everything else seems to be growing at a healthy rate thanks to a nice mix of rainy and sunny days, and we have dreams of building up a few more raised beds and taking advantage of the space we have! Because of the rain and new hobbies, we haven’t found ourselves on the trails as much this month. But midway through, one of Curtis’ shipmates asked if we wanted to do a hike together, and we couldn’t say no! 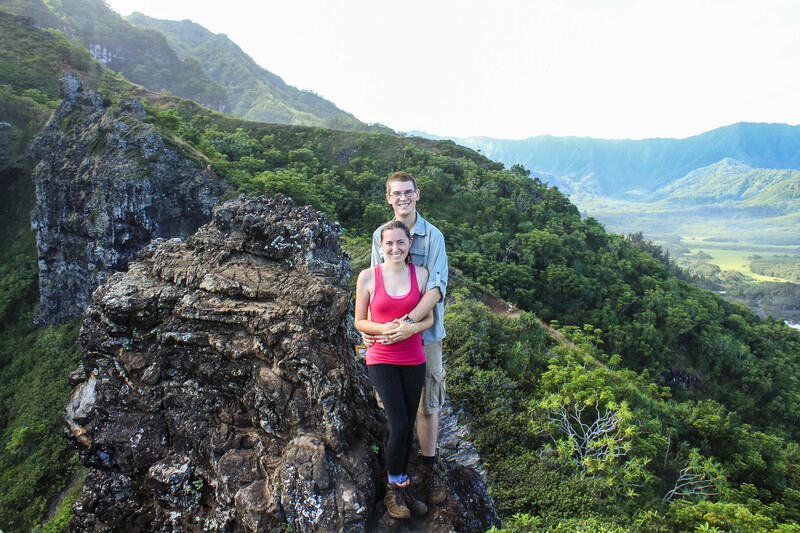 We drove up the Windward Coast to Ka’a’Awa to hike Crouching Lion. While this is a popular hike, it’s another one where the legality is questionable. There are multiple signs at the various trail entrances saying “Do Not Enter,” with the reason being a steep, washed out trail. Some hikers report of there being police there on some occasions turning people away. There weren’t any on the day we went to hike, but we had a plan B in case we weren’t able to hike this one. We parked in the large pull out off of 83, crossed the road and began the trail after the third “Do Not Enter” sign. Supposedly if you take another path behind a different sign, it can take you up a much steeper and more dangerous trail. Today, the trails were dry and the hike was fairly easy in comparison to other hikes we’ve done — it’s just steep and really got our heart rates up. Even if it were more slick, the trail is so short that you could easily afford to take your time and inch your way up and back. 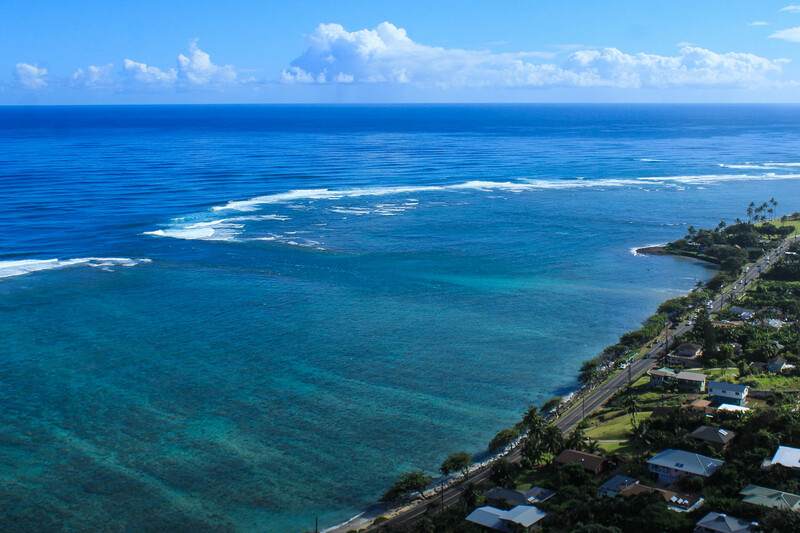 It’s only .4 miles round trip, but offers incredible views of the coast, Kahana Bay and valley, and peaks high above us. The last stretch of trail to the top is the steepest, but going down was honestly harder to me than going up! The top of Crouching Lion is very narrow and doesn’t allow room for the big groups of hikers that climb every day, so we didn’t spend much time here at all. 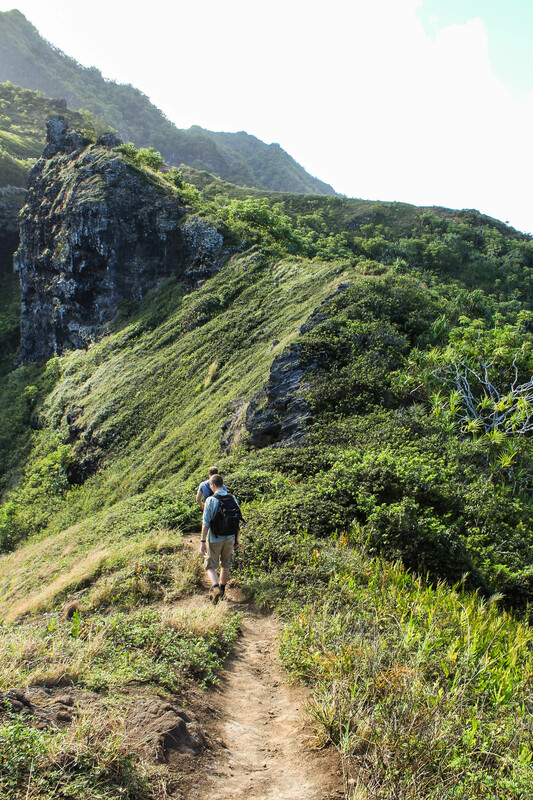 The trail up to the saddle is actually the start to a much longer and more challenging hike up Pu’u Manamana, but we’ll save that for another day. 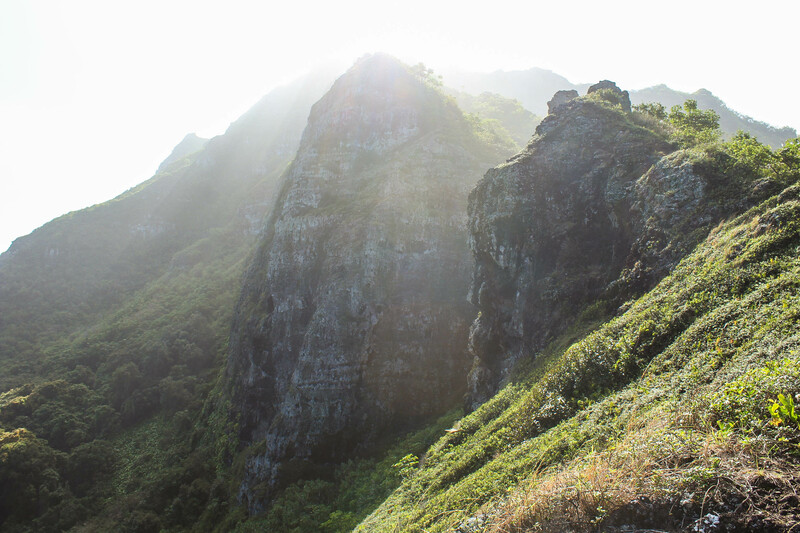 We’re in no hurry to see everything right now — if you ask Curtis, he only has 2 peaks on his Oahu bucket list. I’m sure we’ll get around to doing a lot while we’re here, but I’m enjoying the variety of things we’re doing and investing ourselves in right now.